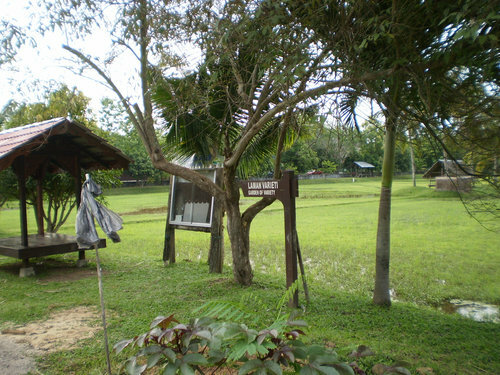 Laman Padi is located in Pantai Cenang and opposite to Meritus Pelangi. It was established in June 1999. From the beach area, it's an easy walking distance. Once you enter through the gate, you will see signs to different sections of the complex including a Heritage Gallery, a Paddy Gallery and so on. But before you start visiting the various sections, ensure that you get hold of a guide. It is free. Although the places looks virtually empty without any soul, there are actually very knowledgeable and friendly guides available in the complex who will take you around and explain almost everything about the place. Unless you get a guide, you will probably wander about aimlessly and come out without having appreciating the offerings of this place. The guide can spend about 2 hours with you and passionately explain the process of growing and harvesting paddy (rice). I came to understand from one of them that before the rice grains are planted, they are soaked in a bag for 3 days, and then planted in a field. In traditional methods, once the paddy (rice plants) grow to some extent, they are removed by hand, split up and replanted in a different field in knee deep water. This entire process of planting and replanting are carried out by women as they are more suited for such work that requires a lot of persistence and patience. 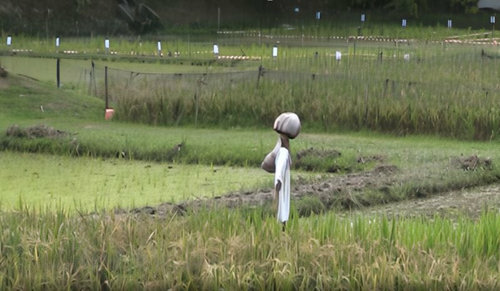 However in modern method, the rice plants are not removed and re-planted. It is grown in the same field, in high density using pesticides so that in a small area large volume of rice can be grown. The traditional method requires a lot of human effort. While the modern method requires lot less human effort, the quality and taste of rice is somewhat compromised. Once the paddy is fully grown, they are harvested by women who pluck them out and make bundles in the field. This is when the men farmers come in and take the bundles away to the rice mills or factory for further processing. When I asked the guide why men would carry them, because of load? He smiled and said ... "No, because it's an easy job for them". 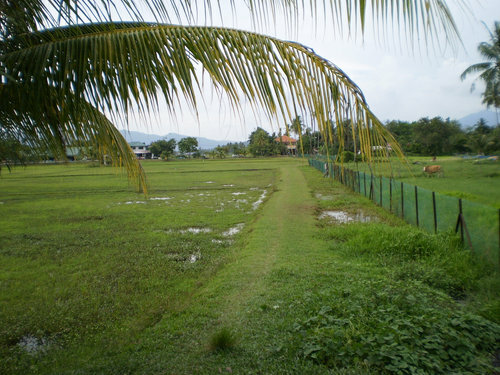 As you move around the paddy fields, you will notice that human like structures are erected in the middle of the fields. This is to get rid of the bird problem. When the rice plants grow, the birds often eat up the grains. You will also find a long nylon rope attached to a brick which hangs against a large metal piece. By pulling it, the brick makes a loud sound against the metal. This is also another way a worker is able to keep the birds away. Actually, you can also participate in planting and harvesting rice in knee deep water. If you express your willingness, the guide will help you with that as well. The section called 'Garden of Variety' is usually the place where you try your hand in rice planting and harvesting. You will find cows and water buffaloes in the field. The muddy holes or pits in the fields are favorite resting places for the buffaloes. While the cows are often seen grazing on the fields. There are also fish trapping water areas in the paddy fields. The guide will show you a net made out of cane that looks like a large inverted cup. You can put it on the cat fish, cover it up, insert your hand through the hole on top, catch it and bring it out. You must visit the Museum or the Heritage Gallery. The air conditioned museum not only serves as a nice respite from the scorching sun, it is a center packed with a lot of information and history of rice. It is usually unmanned. So a guide should accompany you to make the most out of it. 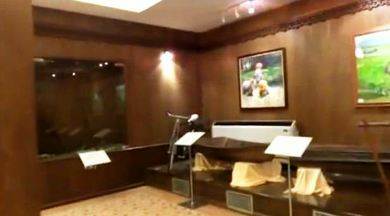 It has on display pictures & photos of rice cultivation & harvesting in the island. There are large glass cabinets in the gallery which exhibit the equipment and tools that were once used for cultivation & harvesting of paddy in Langkawi. You will come to learn about the evolution of paddy cultivation in the island that took place over the years. I would highly recommend a visit to this museum. There is a lovely herbal garden in the premises. The guide will also take you there before visiting the museum. He will explain many different types of local & indigenous herbs, plants and flowers. There is also a Roof Top Garden which offers a lovely views of the rice farms and the fields all around. There is car park inside. There are also toilet facilities here. Laman Padi has two nice restaurants surrounded by lush greenery. One is Laman Ria, a restaurant run by a Japanese couple serving excellent Japanese, Malay, Chinese and Thai food, and the other is Jimmy's Cafe serving nice Asian cuisine including tandoor (made in earthen oven) items. Langkawi Development Authority (LADA) has developed several cottages built in the theme of traditional Malay village cottages. They offer tourists an excellent opportunity to experience stay in traditional Malay Kampung cottages and surrounded by vast paddy fields. The cottages have modern amenities. Go through Gemalai Village to know about the accommodation and how to book. There is also a Spa inside which uses the fresh ingredients from the herbal garden and offers different types of massages and treatments. 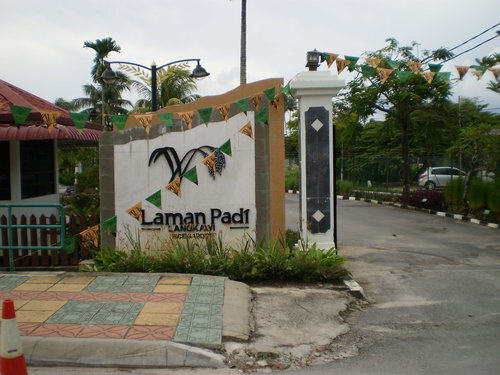 Laman Padi is located in Pantai Cenang on the road Jalan Pantai Cenang and opposite to the Meritus Pelangi Hotel. From the Pantai Cenang main beach area (like Malibest Resort), it would be only about 10 minutes walk. From the airport, it takes only 10 minutes by car.